What would those 19th-century workers think if they could see their Waltham Watch Factory today? 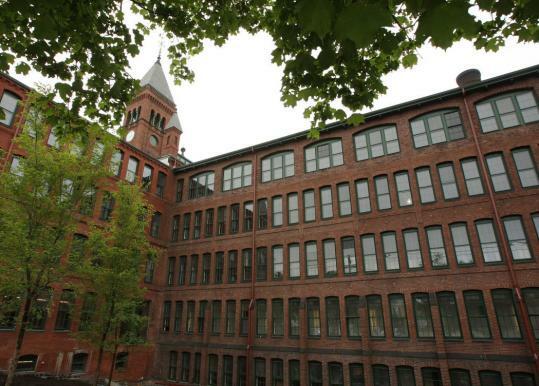 They'd recognize the red brick walls, giant windows, even the view of the Charles River. But where there used to be cutting-edge machinery for the mass production of affordable watches, there will soon be high-tech companies using tools unrecognizable a century ago. The renovation of part of the Watch Factory into offices will be complete at the end of this month. At the same time, a history exhibit will go up in the building, providing an intriguing juxtaposition of past and present. Those watchmakers were leading the Industrial Revolution; their contemporary replacements are at the beginning of their own revolution, a high-tech story that is yet to be written. Separated by more than a century, the future workers at the Watch Factory will likely have more in common with their predecessors than the building. "It was the iPod of its era: The personal computer, cellphone, and nanotechnology all rolled into one," says the history exhibit's narrative, written by Dan Yaeger, executive director of the Charles River Museum of Industry & Innovation. "In the 19th century, a Waltham watch was a high-tech marvel, not because of how it functioned but how it was made. Hundreds of tiny pieces, born of machines, ticking together to keep correct time, interchangeable with any other Waltham watch of the same model the world over. It was a revolutionary product and everyone, it seemed, had to have one." The exhibit, coproduced by the Waltham Historical Society, will feature dozens of items including machine parts and tools, one of the first women's watches, an advertisement with a celebrity endorsement from Franklin D. Roosevelt, and a photo of women supervisors from around 1890. "Particularly adept workers were tapped as supervisors, who watched over six or seven other women. This position was as high as a woman could rise, however, as department foremen were always men. On average, men earned about twice that of women." Watchmaking at the factory halted in 1957, when the company was split in two, but the building was never vacant. A series of tenants plastered or painted over the brick walls and slowly let the history fade. The renovation underway now seeks to restore that lost luster. Although the first phase, 160,000 square feet of office space, is nearing completion, developer Berkeley Investments also has plans for the rest of the 400,000 square feet. Phase two, which is to begin construction in late summer, will comprise apartments, a restaurant, and a cafe. (The Waltham City Council authorized a special permit for residential use late last month.) Phase three will follow with more office space. The sense of preserved history was definitely a factor for the new Watch Factory's first commercial tenant, Passkey International, according to the software company's chief executive officer and president, Greg Pesik. "When we saw the Watch Factory, it just really connected with everybody, just the overall character of the building - frankly, it's cool," he said. Passkey, which moved in April and provides software to hotels and event planners for group reservations, was relocating from Quincy and wanted access to the "strong technical talent" along Route 128 but didn't want to pay Boston or Cambridge rental prices, said Pesik. After looking at the standard glass-and-steel office options with their ubiquitous drop ceilings, he said, the brick-and-beam Watch Factory won everyone over with its "quirkiness, history . . . and warmth." Pesik said the move has had a positive effect on employees. "I think the entire staff felt very reenergized. . . . You can feel it in the building," he said. "Here, the folks can walk along the river, they can walk to Moody Street, to restaurants and bars." Beginning in the 1870s, the original concrete building was replaced with the red-brick structure standing today, which eventually grew to 400,000 square feet and was said to be the largest brick building in the world. It has housed a rich history all the more poignant for its contrast with the city today. Then, Waltham was considered the country, a place workers would enjoy as a bucolic respite, and where delicate watch parts would not be compromised by city dust. Now, Waltham is urban and a hot spot for companies looking to locate along the high-tech corridor of Route 128. Then, workers took a pay cut to minimize job losses during the Great Depression. Now, the developer is hoping the economic downturn won't scare away potential tenants for the office space. Only Passkey has moved in, but Berkeley is "close" on a couple others, according to Eric Ekman, project manager. Then, the factory was a community, which provided childcare, housing, and bowling leagues. Now, designers hope to connect the giant building to a sense of community via smaller touches - landscaped courtyards that invite employees to enjoy a break outside, for example. Yaeger said in a phone interview that the exhibit offers up the history not just of Waltham but also of American business. The Watch Factory was the "Microsoft of its time," he said, and the media followed its every move. There were even souvenir jugs of the watch company for tourists who came to Waltham to see the famously innovative factory. "It impacted the way we look at business worldwide," said Yaeger. When the Waltham Watch Co. got started in 1854, pocket watches were a luxury item, according to the exhibit, because most people didn't need to know what time it was. The Industrial Revolution and the factory jobs that came with it changed that. The company employed machines - very high-tech at the time - to replicate the watchmaking work that previously only highly skilled craftsmen had been able to do by hand, according to the exhibit. That led to more affordable watches. Business boomed. Fast-forward a century. During World War II, while Waltham focused production on timing fuses and electronics, Swiss companies gained a "stranglehold" on the American watch market, according to the exhibit, and the Waltham Watch Co. never recovered. The end of watchmaking at the factory came in 1957, when the company was divided in two. The name "Waltham Watch Company" moved, eventually ending up in Switzerland, where watches are still made today under the Waltham name. When the company fell apart, it was a huge blow to the community's psyche, Yaeger said, but the renovation is a way to reclaim part of Waltham's identity. "The industries themselves might change - we've gone from textiles to watches to machine tools to electronics and high-tech, and now we're into biotech and pharmaceuticals and the like," he said. "The industries might change, but the whole nexus of innovation continues here with the concepts that were brought about by places like the Watch Factory in the early days." The Watch Factory Exhibit will be free and open to the public. It will be located at 221 Crescent St., Waltham, in one of the lobbies of the newly renovated office section.